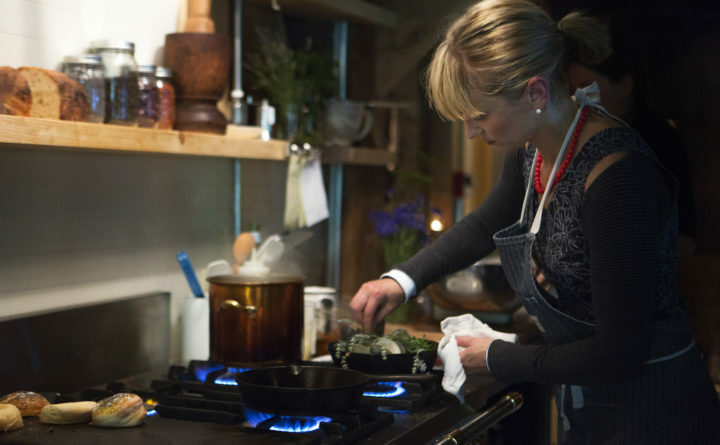 The Lost Kitchen, 22 Mill Street, Freedom, chef and owner Erin French prepares meals during dinner in this BDN file photo. For the first 10 days in April, the post office in Freedom (estimated population 706) was inundated with mail from all over the country and across the world, as thousands of people vied to win the reservation lottery at the tiny town’s best-known (and only) restaurant, The Lost Kitchen. Restaurateur Erin French decided to switch to the old-fashioned mail lottery system for the 2018 season after being overwhelmed last spring by 10,000 phone calls in 24 hours. Back then, the flood of phone calls swamped her three phone lines and caused alarms to go off when the emergency lines to the Waldo County town’s fire department were blocked. This year’s reservation process has been much calmer and slower — though no less popular, according to Michael Dutton, French’s fiance and media relations advisor. He said that the restaurant received more than 10,000 envelopes from places as far away as Hong Kong, the United Kingdom and Malaysia. French and her staff will be picking notecards by random drawing to fill out the season’s schedule. The drawings began Wednesday, April 11, and Dutton said he is not certain when they will end. The restaurant opens for the season on Friday, May 11 and remains open until New Year’s Eve. Last year, diners paid $105 plus tax and tip for the seven course prix fixe meal. Dutton didn’t know for sure what the price will be this year, but believes that reservation winners will be satisfied. And the experience of getting mail from all over the world has been great for French and the rest of the team, Dutton said. Although United States Post Office officials would not comment on the additional mail received this month in Freedom, it’s fair to say that it’s unusual for the town to have thousands of letters arrive from all over the world. “She doesn’t take any of this for granted. When we see a note come in from the far reaches of the planet to this little place in the Maine countryside, it’s amazing. We are amazed,” he said.